After the twelve days of Christmas, Christians celebrate Epiphany on January 6. The word epiphany means “manifestation,” and on this day, we commemorate the Magi’s arrival and adoration of Jesus. It's the day that Christ was revealed to the Gentiles. Epiphany is the culmination of our journey through the seasons: from the longing of Advent, to the jubilation of Christmas, and now a celebration of our unity in Christ. Epiphany reminds us of the universal mission of Jesus. He came for all people — rich and poor, Jew and Gentile, slave and free, male and female — because, as the Apostle Paul tells us, we “are all one in Christ Jesus” (Gal. 3:28). Epiphany always falls on January 6, but since January 6 is often a weekday, many churches hold an Epiphany service on the Sunday falling between January 2 and January 8. For some years, this means Epiphany is celebrated during Christmas. 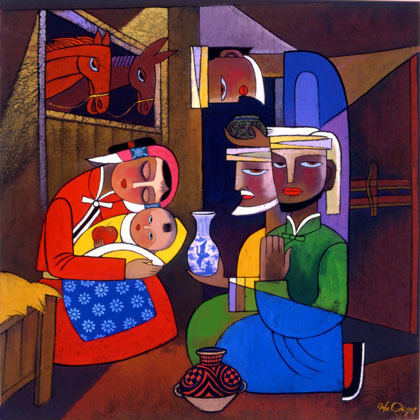 Epiphany traditions vary widely across denominations and cultures — a picture of the beautiful diversity of the church. Two traditions in particular have taken root. The traditional Kings Cake is a cake or pastry with a trinket or other object hidden inside, often a toy baby representing the infant Jesus. Searching for the trinket symbolizes the Magi’s search for the Christ child. Host an Epiphany party, and have your guests bring dishes from all over the world. Top off the feast with a Kings Cake. The one who finds the trinket must host next year’s party. Another tradition involves marking the doorpost of the home with chalk and reciting a brief prayer. The traditional markings are a series of numbers, symbols and letters.